Locating the maiden name of my second great-grandmother has taken over ten years. If I had been able to order film from my local Family History Center, it could have taken several years less. However, thanks to the digitized Ohio death and marriage records on Familysearch.org, I was able to put a surname to the woman who married Florus Allen House (born Jan 5, 1813 in Connecticut, died June 25, 1891 in Tuscarawas, Coshocton, Ohio) on April 14, 1836. From the death record of their daughter, Nancy Elizabeth House (m. Oscar DeLong), the informant, Mabel Harding (her daughter), listed Nancy’s mother’s name as Julia Lewis. Another family member’s death certificate also listed the name Julia Lewis. When I looked up the marriage record, on the off chance it had been digitized by Familysearch.org, I looked for Michigan marriage records because the story had been passed around that Florus and Julia Ann were married in Michigan. I found the marriage record – but not in Michigan – in Muskingum County, Ohio. Florus House and Julia Ann Lewis were married in that county! Upon picking apart the short marriage detail in the book, I saw that after Julia’s name it read: “from Falls Township, Muskingum County.” Since they were married in 1836, I realized I should look at Census records from 1820 (when Julia was about five years old) through 1830. In the 1820 Census records from Fall Township, I found the household of Able Lewis that had 2 females under the age of 10. In the 1830 Census in Falls Township, there were 2 females 10-15 years old. Both records fit Julia’s age. So who was this Able Lewis? Who was his wife? Searching for decendents of John LEWIS b.abt. 1810 Muskingum co., Ohio married Eliza MCVAY in abt.1835 in Cochocton Co. I believe they lived in Falls Township,Muskingum Co. John’s father was Able Lewis and mother was Nancy ROBINSON of Falls Twnshp., Muskingum Co. John had a brother George and brother Edwin. He also had a sister, however I do not have her name. Could this be the same family that I was looking for? In the 1860 Census of Falls Township, Muskingum County, I found a George Lewis who had an eight year old daughter named Julia Ann. Could this George be the same person Mrs. Sabulsky referenced in her post? If he was Julia Ann’s brother, then possibly he named his daughter after his sister. Digging further into the Able Lewis and Nancy Robinson family, I discovered that the spellings of the first name could either be Able or Abel. I also noticed that Robinson was Nancy’s name after her first marriage – her maiden name was either Johnson or Johnston, and she either went by Ann or Nancy. Abel Lewis became a Mason in White Horse Lodge No. 50 in Pennsylvania and worked as a visitor at American Union Lodge before coming to Zanesville. He was the first clerk of the court of common pleas in Muskingum County and postmaster of Zanesville in 1805. He became insane in 1813 and was supported by his Masonic brethren in the county jail until he escaped in 1826. He was never heard from again. than a half century he has been a resident of Poweshiek county, having come here in the days of his early manhood, his birth having occurred near Zanesville, Muskingum county, Ohio, on the 12th of October, 1835. He was, therefore, about twenty-two years of age when he arrived in Poweshiek county and nine years later was admitted to the bar. He comes of Welsh and German ancestry. His father, John M. Lewis, was born in Muskingum county, Ohio, his natal year being 1811. He was a son of Abel Lewis, who was born near White Sulphur Springs, Virginia, and was a college graduate. In the latter part of the eighteenth century he removed to Ohio and became a government surveyor in Muskingum and Coshocton counties. He took part in several of the Indian wars and was closely associated with many of the events which led to the reclamation of Ohio for the purpose of civilization. Following his marriage he established his home in Zanesville and there served as clerk of the court for four years. He was also the author of some mathematical works. Entering a large tract of land, he became interested in agricultural pursuits, took up his abode on his farm and spent the residue of his days there. For many years he was a member of the Methodist Episcopal church and his entire life was the exemplification of his Christian belief. John M. Lewis, the father of Judge Lewis, married Louisa A. Ramey and settled upon a part of the old homestead, five and a half miles from Zanesville. Subsequently he took up his abode at New Castle, Coshocton county, Ohio, and engaged in merchandising as a member of the firm of Thornhill, Berry & Lewis. The discovery of gold, however, attracted him,to, California in 1851, the journey to the coast being made by way of the’ jsthrmts of Panama. He spent two years in prospecting and mining, in whicline was cf afcljj successful. He then returned to New Castle and soon afterward retired from business. He, too, belonged to the Methodist Episcopal churclT,-<and,,hisj)Qliiical allegiance was given to the republican party. His wife was born”in Muskingum county, a daughter of Sanford Ramey, a native of Virginia and of German descent. He became one of the early settlers of Ohio and his daughter Louisa was born and reared in that state. Her death occurred in 1886. Judge Lewis, the eldest in a family of ten children, spent the first ten years of his life in his native county and then removed with his parents to Coshocton county, Ohio. For four or five years he attended school during the winter months, the remainder of the year being spent in assisting his father in the store. He was also at intervals engaged in farm work and took up the study of surveying. He read law in New Castle and while thus engaged followed the profession of surveying for several years. In 1856 he took the first step in the removals which brought him eventually to Iowa. In that year he became a resident of Southport, Peoria county, Illinois, where he worked at the carpenter’s trade and also spent a month in farm labor. During the winter he taught school at Southport and in the spring of 1857 he came to Montezuma, then a little village of four or five hundred inhabitants. Since that time he has continuously resided in Poweshiek county and has made for himself a high and eviable position in the regard of his fellowmen. Through the summer months he worked at carpentering or at other employment which he could secure and his evening hours were devoted to the further study of law. He thus soon qualified for admission to the bar but he determined not to seek admission until he felt that he could give his entire attention to law practice. He recognized the fact that to do this he must have a certain amount of capital to tide him over that initial period in the life of every lawyer when he must spend some time in waiting for clients. In the fall of 1857 Judge Lewis secured the position of principal of the public schools and did splendid works as one of the early educators of Poweshiek county. While active in that capacity he was largely instrumental in organizing the teachers’ institute and he also graded the schools of Montezuma. This work alone would entitle him to the lasting gratitude of his fellow townsmen. In 1862 he was elected county superintendent of schools and before the expiration of his term was chosen by popular suffrage for the office of clerk of the county and district courts. In the latter position he served acceptably for a term, after which he resigned to form a partnership with Hon. M. E. Cutts, former member of congress, to conduct a milling business, which was carried on successfully for a great period, after which he sold out. For a year he occupied the position of deputy treasurer and for two years as a member of the county board of supervisors served as its chairman. He has ever regarded a public office as a public trust and it is well known that no public trust reposed in Judge Lewis has ever been betrayed in the slightest degree. Capable, diligent and loyal, he won the confidence and good-will of the public through his devotion to duty in the offices which he was called upon to fill in the earlier years of his residence here. Following his retirement from the bench Judge Lewis during the year 1891 acted as general manager for the Hawkeye Electric Manufacturing Company, with headquarters at Davenport, but in the fall of 1891 again took up his abode in Montezuma and has since been actively associated with the work of the courts and at seventy-five years of age has a large and lucrative law practice, doing as much court work as he ever did in his younger days. In addition he has proved his worth in the management of commercial interests. He was one of the organizers of the Montezuma Electric Light & Power Company, superintended the construction of the plant and took up the management of the business. He also superintended the erection and installation of the electric light works at Bloomfield and at Sigourney and assisted in surveying the route for the Grinnell & Montezuma Railroad. He made and published the first map of Poweshiek county and at all times has been closely associated with the growth and progress of the county not alone by reason of his connection with industrial and commercial affairs or with the legal profession but also because he has been the champion of every project and measure which he deemed of value in the public life of the community. He was again called to office in the fall of 1897, when he was nominated by acclamation for the state senate at the republican convention of the twelfth senatorial district, comprising Poweshiek and Keokuk counties. The election showed that he was the popular candidate and for four years he remained a member of the upper house. He gave careful consideration to each question which came up for settlement and left the impress of his individuality and ability upon the laws enacted during that period. In 1865, in Burlington, Vermont, Mr. Lewis was united in marriage to Miss Mary E. Cutts, a daughter of Edwin Cutts, of Brandon, Vermont, and a sister of M. E. Cutts, of Oskaloosa. The marriage relation between them was always of a most ideal character and the deepest grief in the life of Judge Lewis came to him in the death of his wife on the 10th of April, 1893. Fraternally Judge Lewis is connected with Masonry as a Knight Templar and belongs also to the Iowa Legion, the Ancient Order of United Workmen and to the Iowa State Bar Association. He has never faltered in his stalwart support of the republican party and its principles and has served as chairman of the county central committee. He was a member of the first city council of Montezuma and while important political interests relative to the work of the courts and to the law-making body of the state have claimed his attention he has never considered himself above the duties connected with the management of local interests. A lifelong member of the Presbyterian church, he has served as elder and trustee and for a number of years was superintendent of the Sunday school, in which position he continued until his election to the bench. He is today one of the oldest residents of Montezuma in years of continuous connection with the city, and among the men of Poweshiek county who have been long in public service the record of none has been more constant in honor, fearless in conduct and stainless in reputation. There is solid documentation that any of these people are the family of my Julia Ann Lewis. However, I have information that I can try to disprove now. The one thing I do know is that Julia Ann Lewis is my second great-grandmother – who her parents and siblings were is still up for debate until I find hard evidence. A comment left on one of my posts mentions a family that I have never heard of and can’t begin to understand exactly why it was left. The commenter mentions a lady whose family they are searching for and goes on to describe relatives and children of this woman. Apparently someone looking for that particular family saw the comment (probably after googling the name) and left another comment – which is still unpublished and then another comment was left – also unpublished. I had responded to the original comment that I wasn’t related to that family and believed they had left comments on the wrong blog post. After looking at all three of these comments, I have decided to write this blog post about them. Hopefully, those who are searching for the same people will be able to contact each other and get more information. “I came across a posting for the family of Cassie Whittlesey. No other information other than her husband’s name. LDS church member from Spokane, Washington area. Cassie Whittlesey father’s name was Asa Gore, and his father was Wm G. Gore. His first wife’s name was Casey Warren, also listed in the LDS church in Los Angelos Calif. They were married April 6th, 1833 in ? MS. They had one daughter married a Traxler from Rankin Ms. Mary Gore Traxler. Wm G. Gore’s second wife was Elender maiden name Unknown. She was in fact a full blooded Cherokee. She was not of the Hennigan family. She is other another group. Wm G. Gore family is unknown also. Cassie Whittlesey mother was Anna Slena Slaydon Gore. The Slaydons were from the Indian Village of Leon Texas, in Cherokee County Texas. Asa Gore had 5 daughters and 2 sons. 3 daughters moved from La to Calif.
His son Willie Ethan Gore’s boat was shot and sunk in the Phillipines during WWII, and listed as MIA and a marker is listed placed in the Midway Islands for his patoon and him. If you are one of these commenters – or have information that could help them – please shoot them an email and help them out! Unfortunately, I do not have any information and I am not related to any of these people (nor am I looking for them). Thanks! UPDATE: I believe that these persons were searching for a woman named Mary Gore Traxler (let’s see how many more people find my blog now!) – and came across my blog because my Dad’s uncle – Clarence Wesley Amore married Mary Ann Traxler. Mary’s father was John Traxler and her mother was Mary Tunney. So my Mary is NOT the Mary the others were searching. Whew! At least one mystery is solved! This picture (to the left) was taken in 1954; location – Japan when my parents were stationed at Tachikawa with the Air Force. My impression has always been – what a sad tree! 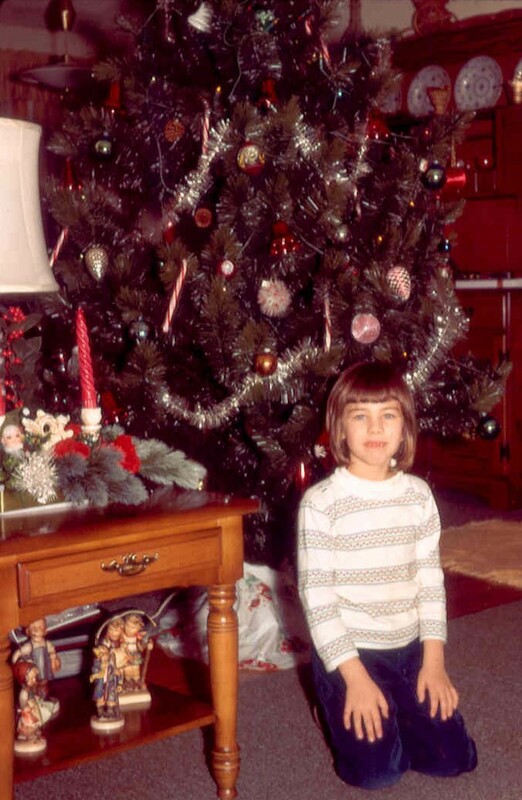 I believe this was the only type of tree that would work as a “Christmas” tree – short of buying an artificial tree from the Base/Post Exchange. I hadn’t been born yet but my sister and brother were the children who had “visions of sugarplums” for that year’s Christmas. This picture (to the right) was taken about 1968 when I was a little over 7 years old; location – the house I grew up in east of Dayton, Ohio. I obviously have some teeth missing! Those pants were not purple – from what I remember – but blue. 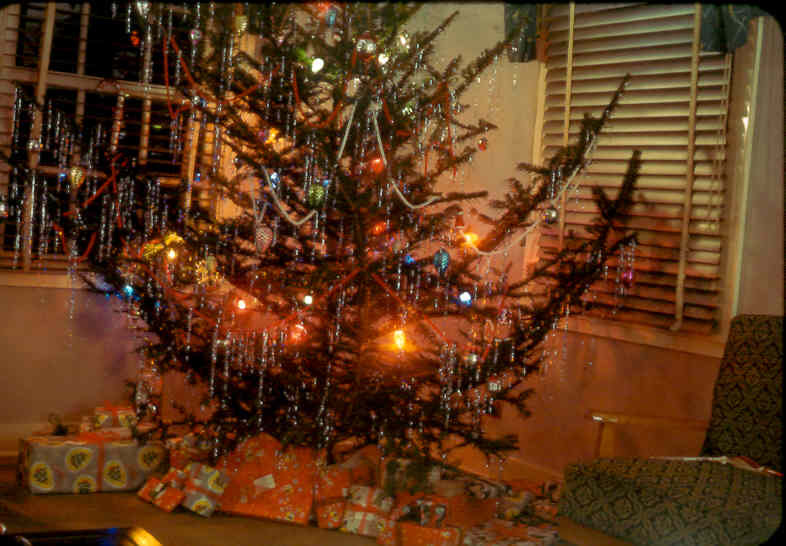 This is the artificial tree we used – it was only a year or two old because I remember having live trees when I was very small. Mom used this artificial tree at least until the time I was 18 years old and then I think she gave it to my cousin. This tree is set at the corner of the living room and formal dining room. From what I remember, this was the same location it was set year after year. During my childhood, Christmas dinners were always at our house. Those who attended included my maternal grandparents, my sister, her husband, and two kids, my brother and his wife (and later their son), and sometimes my brother-in-law’s parents. This photo (to the left) was taken in 1991 either before we left or after we returned from Christmas Eve services at our church. 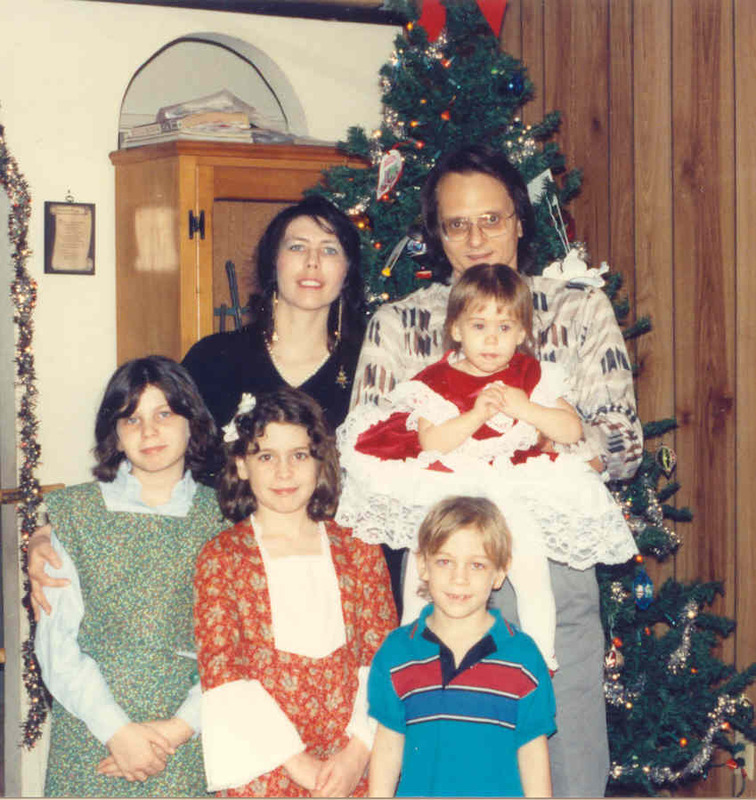 This is one of the very few pictures I have of our family by the Christmas tree. Boy, my husband and I look so young! Our youngest was a few months shy of two years old and our oldest was a month away from 10 years old. Our second daughter had just turned eight and our son was six and a half. Over the years, our tree has moved “around” the living room. We had it in this location for a few years and for the last 10+ years it has been in the opposite corner. Our Christmas tradition since this photo was taken has rarely changed. There were some years that we went looking at Christmas lights after church. We’ve always had a meal of “finger food” late in the evening – I’ve made sausage balls, cheese and crackers, stuffed shells, deli meat sandwiches, fresh vegetables and dip, and more. The last couple of years we have had Wing Stop chicken wings and tamales from our local tamale factory. The first year we decided on wings, the restaurant was open until 8 p.m. on Christmas Eve so we picked up the order as soon as church was over. Last year it closed early, so I had to go pick up the wings and fries and try to keep them warm the rest of the day. The french fries did not fair very well – so I don’t think we’ll do that this year. On Christmas Day we’ve had the traditional dinner – turkey (and sometimes ham), dressing, mashed potatoes, homemade giblet gravy (and turkey gravy from a jar for those who won’t eat the other kind), green bean casserole, Christmas cauliflower, scalloped corn, and pies. There were years that I started making cookies in the middle of December and other times, I just don’t bother! I’ve made homemade chex mix for gifts to friends and family. The last two years one of our daughter’s has had us to her home for the Christmas dinner. Our oldest daughter hasn’t been able to be with us for Christmas in over seven years. For the last 5 years, we’ve enjoyed being with all four grandsons. 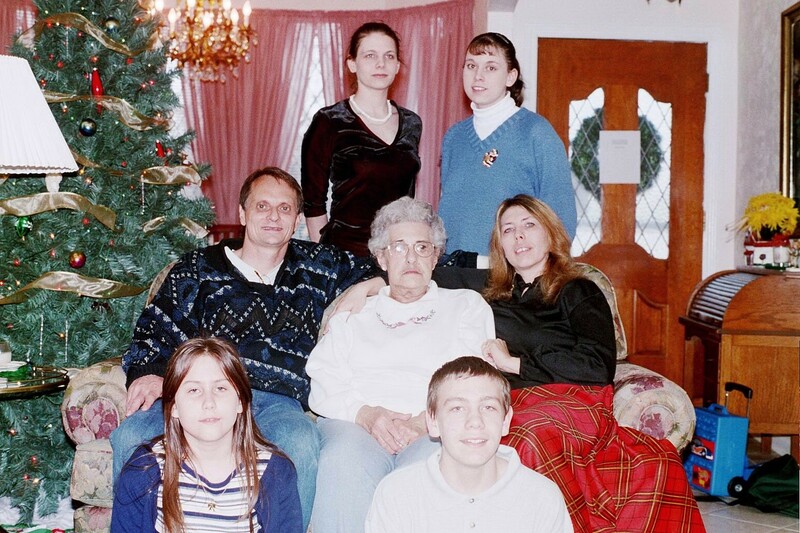 The only picture of our family with my mom was taken at my sister’s home in 1999. Our kids ranged from almost 10 to almost 17. That year we had Christmas dinner at my sister’s home and my contribution was my Christmas cauliflower and something else! See the red plaid skirt that I’m wearing? I wore this at almost every Christmas from 1978 until just a few years ago! Although this photo was taken in 2008, this could be a photo from today. 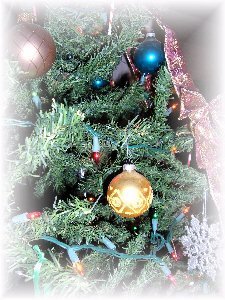 The Christmas tree is in the same spot – although our present tree is a new artificial tree – and I haven’t added any garland to it. This year I will use strands of beads as garland. Our Christmas this year will begin on Christmas Eve when we attend our Worship Celebration at our church of over 20 years. Then we’ll come back home and eat our “finger food” dinner, culminating in the reading of “The Night Before Christmas” (a tradition since the children were all small) and the Biblical Christmas story. 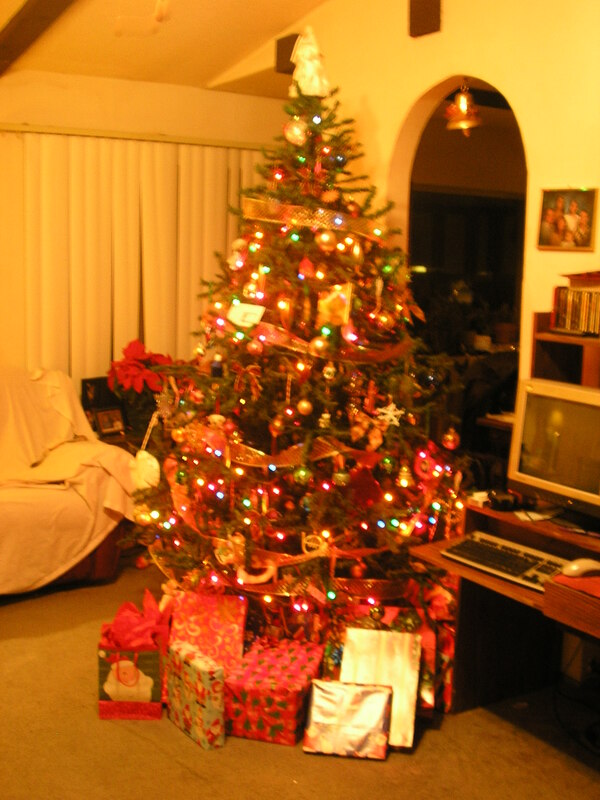 We’ll set our presents out under the tree after the grandkids go to bed and then later, Santa will arrive. He’ll find a cold glass of egg nog in the fridge in case he’s thirsty and a couple of cookies with a note to him on the kitchen table. This year Christmas falls on a Sunday – the first one in six years – so our morning will be very early! I have always had a family breakfast before presents are opened and this year, I think I will have a crock pot breakfast casserole that has cooked through the night. After we eat, it will be time to dig into gifts and take pictures. At 10:30 we’ll be at our church, celebrating the real reason for Christmas. Then it will be home to finish cooking the dinner. Hopefully, I’ll get the turkey in the oven before we leave. One of our grandson’s might not be with us that day – perhaps late in the evening. The kids will be playing with new toys, probably have new movies playing on the TV, and the aroma of delicious food cooking. In the future, I hope that we can still enjoy our grandchildren – and further into the future – our great-grandchildren – and our children and families at Christmas. Wherever we are, we’ll still decorate a Christmas tree – big or small. Some of our traditions may continue and some will be replaced with new traditions. We’ll still have some of our tree ornaments – especially the really nice handmade ones that the kids and grandkids have made. Pictures will still be snapped and food will still be eaten. I may prepare a traditional Christmas dinner, yet I see myself changing it in my golden years – especially if there are only my husband and I sharing the holiday together. No matter the year, we’ll always remember the joy of Christmas’s past and the true reason we celebrate the season! As Christmas approaches, I realize that soon I will need to write my annual Christmas letter and get the Christmas cards addressed for the mail. I have a list of addresses I use for my holiday cards, adding and removing from year to year. That led me to wonder how technology has changed the way we send Christmas greetings and how we store addresses. My approach each year is to pull up the previous year’s Christmas letter that I save in my word processing program. I use that as the template for the current letter as it keeps me on track. The letters are printed out on special 8.5×11 holiday stationery. Some of my Christmas cards don’t require letters – generally those go to church friends or others who I see on a regular basis and know what my yearly activities have been. Distant family members and friends get a letter and a card. Then I pull out my address book to address all the cards. There are those who have moved and lacking a current address, I attach my Christmas letter to an email. So I have mixed both current technology – computerized Christmas letters -and old-school address book to complete the Christmas card task. There are some people who have all of the addresses and information in their smart phones or tablets. If their phone gets lost or suffers major damage, all of that information could be lost. Future generations would never have an old-fashioned address book to look through, perhaps with clues as to their parents’ or grandparents’ friends or relatives. I’m fairly lucky in that respect. My mom had kept my grandparents’ address books after they passed away. When my mother passed away, I got her address books and those of my grandparents. In those pages are names that I know, reminding me of times in the past. There are also names of people I had never heard of, which gave me pause as to what the relationship was. There are also notations by names – death dates, the word “cousin”, etc. Those clues have proven very useful in my family research. I worry that the digital age will change all of that. As our ancestors kept journals or diaries – we write blogs and websites. In high school we passed notes in class and between classes. Today, students text each other. My grandparents and mom wrote letters daily and weekly when they were apart due to military transfers. We write emails or update our Facebook status. Even if everything in cyberspace will remain for eons, there is no tactile experience. The feel of the leather address book covers, the brittle onion skin typewriter paper, or the embossed stationary can bring the past into the present. The handwritten words of a beloved ancestor or family member long since passed can shed light on what was important to them at that time in their life. In contrast, words in an email – sentence fragments, texting language, upper caps “shouting”, and short messages don’t say much about the writer, other than they used technology. Even in this hurry up world we live in, perhaps it is important to revisit our ancestors’ (even parents’) use of the handwritten word – especially when it comes to addressing our cards, keeping our address books, and a long distance letter or two.